Outdoor steel multi use games area MUGA basketball and football goals supply and installation. Optional enclosed sports court surround fencing. Solid in ground steel sports goal units ae designed for public play parks, playgrounds, schools and leisure parks. The robust steel outdoor anti vandal MUGA goals are fixed directly into the ground to create a robust public use sports area for junior or senior outdoor players. We can also design and supply exterior public use steel anti vandal sports court fencing and enclosures, security gates, seating and sports safety surfaces. Steel anti vandal multi use games areas can quickly transform tired urban areas into lively activity islands for our restless natives..
OMG 210 outdoor ground fixed all steel mini football goalposts. OMG 480 all steel basketball and football combination multi use sports goal. OMG 500 all steel basketball and football combination multi use sports area. OMG 550 all steel basketball and football combination multi use sports area. OMG 650 all steel basketball and football combination multi use sports area. OMG 510 all steel basketball and football combination multi use games area. OMG 560 all steel basketball and football combination multi use games area. 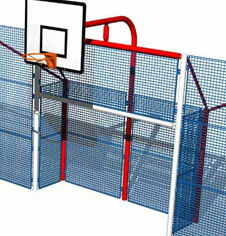 OMG 590 all steel basketball and football combination multi use games wall. OMG 100 anti vandal municipal MUGA sports multi use games area. OMG 400 anti vandal municipal MUGA sports multi use games area. OMG 610 all steel basketball and football MINI full fenced sports enclosure. OMG 660 all steel basketball and football MUGA full fenced sports enclosure. 30mm thick 0.5m square play tiles. Outdoor PVC 20kg play bark chippings. Outdoor PVC grass throwdown mats. Polymeric wet pour play surface installation.